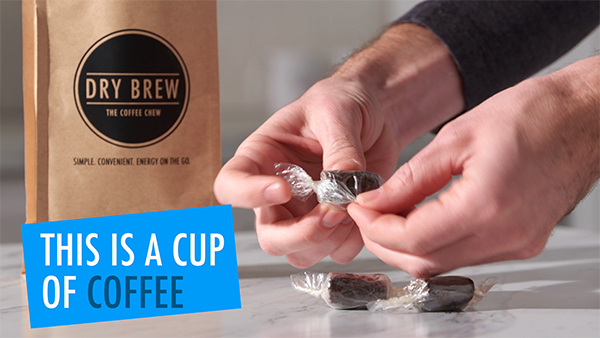 Dry Brew Chewable Coffee: Soft candy made with real coffee. Just because you’re in a rush to get up and go in the morning doesn’t mean you have to forfeit the flavor of your get up and go beverage of choice. 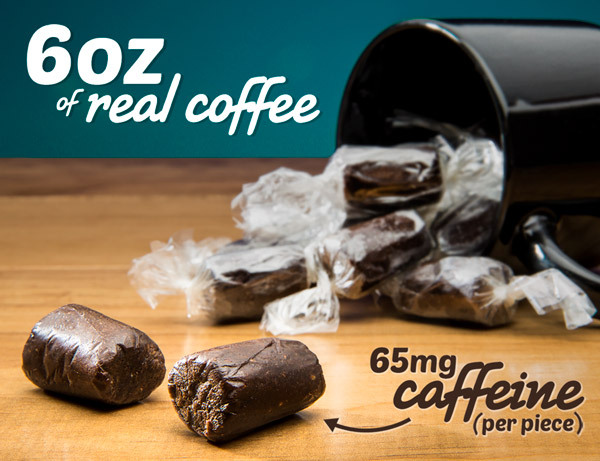 Get your caffeine fix in the form of a chewable zero-prep Dry Brew Chewable Coffee. Each soft candy contains real coffee with the same amount of caffeine as a small cup of java. With the flavor of a bold, rich dark roast balanced with a hint of sweetened milk, it also satisfies your senses of taste and smell for a coffee ritual that can fit into any morning. Warning: Not a coffee flavored candy. This product contains the good stuff (aka caffeine)! The ritual of preparing and enjoying a cup of coffee is a wonderful way to start the day. Unfortunately, not everyone has the luxury of time to sip on their cup of joe. Luckily, there's Dry Brew Coffee Chews that deliver the same bold coffee flavor and caffeine kick in a convenient chewable form. With a texture not unlike an oversized Tootsie Roll, Dry Brew gives your taste buds the same delicious flavor of coffee—because they're made with real coffee! It's a cup of coffee without the cup. How does Dry Brew Chewable Coffee taste so much like the real thing? Because it is the real thing! Each coffee chew contains the same amount of coffee used to brew a 6 fl. oz. cup, which has the added benefit of delivering 65mg of much-needed caffeine. The bold, roasted flavor of coffee is paired with sweeteners and coffee solids for a well-balanced waterless coffee. It tastes like coffee because it is coffee. If you walked up to a barista and asked for fifteen coffees for yourself, you might get at least one nasty look. And then as you drank them, day after day, they'd start to go bad and taste nasty. 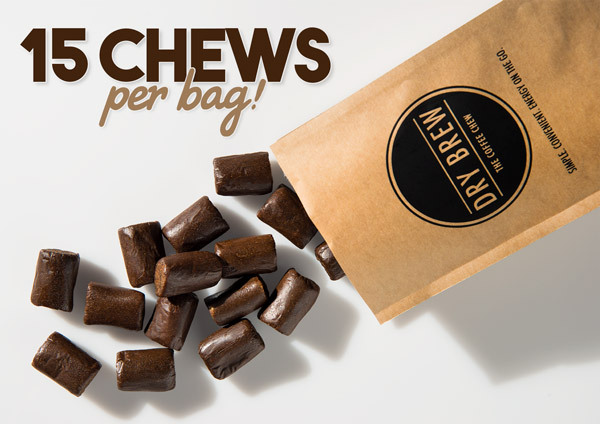 But every one of the fifteen Dry Brew Coffee Chews in each bag will put a smile on your face and make your tongue do a dance of joy. Convenient, delicious, and caffeine-carrying, each chew is as delicious as the last, no matter when you eat it. To avoid jitters, you probably don't want to eat them all at once. Answer: Corn Syrup Solids, Coffee, Artificial Sweetener (Dextrose, Maltodextrin, Aspartame, Acesulfame, Potassium), Water, Hydrogenated Vegetable Oil (Coconut and/or Palm Kernel and/or Soybean), Sodium Caseinate (A milk derivative), Dipotassium Phosphate, Mono and Diglycerides, Sodium Aluminosilicate, Artificial Flavorings, Annatto (Color). Question: Could I soak it in water to make coffee? Answer: Considering the taffy texture, it would probably take a very long time, taste worse, and be less convenient than enjoying a coffee chew straight from the wrapper.